The Gunner Barbell is a Weightlifting, Olympic Weightlifting, Powerlifting, Multipurpose ‘All-Rounder’ barbell ideal for moderate and experienced lifters. Perfect for cross training, performing WODs, athletic clubs, corporate and personal trainers. A more purposeful bar for cleans, jerks and snatches. Gunner by name and a gun of a barbell. The Gunner Barbell is ready to attack your next WOD. This barbell is designed for those with a military mindset to training. Ideal for athletes and competitive lifters. Backed by the Force USA Diehard Warranty which also covers CROSSFIT USAGE. See warranty info for full details. Knurling dimensions and IPF/IWF spec positioning provides comfortable grip for variable exercises and holds. The Gunner Barbell is the next step above the Patriot Barbell as a more purposeful bar for cleans, jerks and snatches. Great whip for the experienced lifter to feel fluid movement throughout the lifting action and get crucial feedback from the bar so you know when you’ve truly nailed the lift. You’ll be smashing out your WODs and hitting your PB more frequently with the great feel and experience you get with this bar. An ‘All-Rounder’ barbell, the Gunner Barbell has a 28mm shaft for Weightlifting, Olympic Weightlifting, Powerlifting and multi purpose barbell requirements to perform a vast array of barbell exercise movements. The Gunner Barbell has 5x bearings in each sleeve! Combined with stainless steel bushings, the bar has an incredibly smooth feel throughout the lift which has to be experienced to be believed. With an amazing 235,000 PSI tensile strength, the Gunner Barbell is the ultimate strength training weapon. The shaft on the Gunner Barbell is finished in Black Zinc. A much higher quality finish than oxide with far superior rust protection. This provides a surface which takes chalk well and provides an excellent feeling in the hands. It looks mighty fine too. The Gunner Barbell sleeves are immersed in a bath where zinc is plated onto the steel. Bright Zinc gives a premium quality finish and strong corrosion resistance. 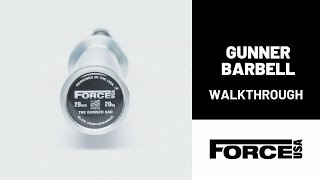 The Gunner Barbell has added grooves in the sleeves holding our ForceUSA branded silicone bands. If you have your own customised bands with matching dimensions you can swap out the ForceUSA bands with your own for easier identification if you own a range of bars. Or simply to show off your own brand. This is very beneficial for clubs, coaches, personal trainers and athletes. The massive 1,500LB Weight Rating gives strength and confidence in being capable to take you beyond your goals. Very happy, knurling is a perfect feel with no centre knurl and great whip.